ReVO Premium Child Sized Ear Muffs are available in more than 10 styles/colors! Note: For your convenience, in the Choose Color drop down box above, we show only those colors/styles that are in stock and ready to ship. If you need one of the colors/styles not listed in the Choose Color drop down box above, just give us a call and we can tell you when we expect your color/style to arrive. At NRR 25, ReVO is one of the highest rated ear muffs made to fit children available at any price. Compare that to other kid ear muffs with ratings of NRR 19 to 21. If you are planning to take your child with you at shooting events, rock concerts, NASCAR events, or other very loud venues, ReVO is absolutely your best choice. ReVO is a truly revolutionary noise protection ear muff packed with premium features. Unlike ordinary kid ear muffs that are nothing more than a repackaged grown-up earmuff, ReVO was made to fit your child, from the ground up. Heavily padded headband, sized for a child's head. Great size for smaller adults too. Extensive headband adjustment that allow for many years of use as your child grows. Extra padding in the ear seals to gently seal against a child's tender face and head. Super soft Pro Form Leather ear pads to reduce irritation and sweating under the pads. Smaller ear cup openings to better fit young children and babies. NRR 25! One of the best noise reduction ratings available anywhere in a hearing protector made for kids. Available in many different styles/colors (Click to see them all!) to let you make the style statement you want. Pro-Ears ReVO Premium Noise Protection Ear Muffs for Babies and Children (NRR 25)5brienJuly 20, 2016Worked awesome at the nascar event at New Hampshire Motor Speedway. My 3yo daughter didn't want to come home. We even watched the start of the modified race about 20 feet from the catch fence, she loved it! Pro-Ears ReVO Premium Noise Protection Ear Muffs for Babies and Children (NRR 25)5AustinMay 30, 2015My two year old kept them on the entire concert because they were comfortable and they work great! Pro-Ears ReVO Premium Noise Protection Ear Muffs for Babies and Children (NRR 25)5MarcMay 27, 2015I ordered two of these by my two kids and they were perfect. I wanted them because the kids like to ride on our mower, but it's pretty loud. They work great. Pro-Ears ReVO Premium Noise Protection Ear Muffs for Babies and Children (NRR 25)5John BuellApril 27, 2015We bought two pair of these for our 4 month old and 3 year old boys. We visit our local dragstrip and wanted better ear muffs than we could find locally. They fit both kids great and the 3 year old loves them! Pro-Ears ReVO Premium Noise Protection Ear Muffs for Babies and Children (NRR 25)5Bruce KNovember 21, 2014Bought these for my grandson. Very well made and adjustable. Have not had the chance to take him to the races yet but I believe these are high quality. Pro-Ears ReVO Premium Noise Protection Ear Muffs for Babies and Children (NRR 25)5"d"September 21, 2014I bought these for my grandson to wear at Disney as he has sensitive ears and as such loud noises bother him. They were a lifesaver. We were able to ride all the rides where loud noises were an issue and best of all we were able to enjoy the fireworks every night especially the ones at Mickey's Not So Scary Halloween Party. I would highly recommend these to anyone. Pro-Ears ReVO Premium Noise Protection Ear Muffs for Babies and Children (NRR 25)5StefSeptember 14, 2014These have been a godsend! The help keep out the extraneous noises that her sensitive ears hear. She is able to stay on task and enjoy many experiences she wasn't able to enjoy without them due to the loudness of some atmospheres. They have changed her life. We have 2 pairs. One for school and one for home. I highly recommend these if your child has any hearing sensitivities. Pro-Ears ReVO Premium Noise Protection Ear Muffs for Babies and Children (NRR 25)5JenJuly 1, 2014Bought these for my two year old son to use at a live WWE event, and he also uses them when he plays on our adult drum set. He loves the skulls, it makes them cool to wear. They also fit me well, WAY better than the ones work provides, so I'm buying myself a set to wear while I work around my C130 airplanes. Pro-Ears ReVO Premium Noise Protection Ear Muffs for Babies and Children (NRR 25)5ChrisFebruary 25, 2014I bought these for my daughter to take her to the Monster Jam. She loved them perfect fit and comfortable. I would strongly recommend these to anyone. Pro-Ears ReVO Premium Noise Protection Ear Muffs for Babies and Children (NRR 25)5Tom CJanuary 19, 2014I bought these for my 5 month old son to go with us to a Colorado Mammoth game. The place is always so loud and he ended up taking a 20 min nap with these on. They never seemed to bother him at all. Great product. Pro-Ears ReVO Premium Noise Protection Ear Muffs for Babies and Children (NRR 25)5KathieSeptember 22, 2013Bought a pair of orange (we are hunters in our family) ear muffs for my 4 month old grandson....though not for hunting purposes. His father (my son) is in a band and was performing in an outside arts/music festival last weekend. They were perfect for the occasion! Little man was able to be held by his mommy right up front near where daddy was playing! He could see, and grin at his daddy and bandmates; and daddy could enjoy having his wife and baby at the performance where he could see them. He wasn't bothered at all having something on his ears. He was so cute, and got a lot of thumbs up from people passing by. While walking around looking at art, he was able to have them close by whenever near another stage with a band playing. The company was true to their word on speed of shipping. I ordered a color not shown on this site, and was afraid they might not get there in time (they live in a different city from me). We all are thrilled with the product. Love the little storage sack that comes with the ear muffs so they can be put up when not in use. This Grandma is happy with her purchase, and so is everyone else. He was a face book hit when pictures were posted. Thank you Pro-Ears for great products! Pro-Ears ReVO Premium Noise Protection Ear Muffs for Babies and Children (NRR 25)5BillSeptember 13, 2013Took my 3yr old and 18 month old to the drag races for the first time and wanted the best ear protection possible and these delivered!!!! And my kids hate things on their heads but they wore these all nite with no issues and thought the races were great!!!! Pro-Ears ReVO Premium Noise Protection Ear Muffs for Babies and Children (NRR 25)5DebSeptember 3, 2013My grand daughter wore these to the midget races in Sun Prairie, WI and they were awesome! At 3 months old she smile and cooed while the race cars went around the track and then fell asleep. I've seen her startle when someone slams a door, but not a hint of any noise bothering her during the races. I was so impressed I already ordered and received the same pair (different color) for the next grandchild that is on the way. I ordered them on a Monday and by the end of the week they were already in the mailbox. Pro-Ears ReVO Premium Noise Protection Ear Muffs for Babies and Children (NRR 25)5CarmenAugust 30, 2013I bought these 6 months ago for my now 10 month old daughter. We have been to roller derby, concerts, movies, you name it, with these in tow. They are absolutely wonderful! She doesn't mind them being on (sometimes we have to keep her hands off of them, but it's more curiosity than anything). She will wear them for extended periods and doesn't seem to mind at all. At the last concert we were at I can't tell you how many people commented and asked where we got them. I just kept telling people to look up "got ears?" and they would find it. I recommend to everyone because it makes babies so much easier to take everywhere when you don't have to worry about their fragile hearing. Pro-Ears ReVO Premium Noise Protection Ear Muffs for Babies and Children (NRR 25)5JvAugust 25, 2013I ordered this year protection for our three month old Baby. We went to drag races and they worked perfectly. Our son was sleeping during the whole thing, And it was super loud! They didn't seem to fit too tightly on his head but were snug. Pro-Ears ReVO Premium Noise Protection Ear Muffs for Babies and Children (NRR 25)5Wyatt's MomAugust 22, 2013After wearing his boring bright blue headphones for the past three years, my VERY hyperauditory sensitive boy needed a new pair. I found these and let him pick out which design he wanted which ended up being the skulls. When the headphones arrived, I had a very happy rising second grader. He is proud to wear his headphones and calls them his "second grade headphones." They are way cooler that the previous 3M blue ones and seem to do the same job. The bag that goes with them are also very convenient. I am impressed with the warranty...as my son will not go anywhere without his headphones so the product HAS to be durable. Initially, I was afraid that they would be too small as most of the reviews were for very small children. However, these are great because they adjust to fit whatever size head you need to fit. They are a little tight but perhaps that is because they are new and need to be worn in. Overall, a great product that both mom and my hyper-auditory sensitive kid are happy with. Thank you! Pro-Ears ReVO Premium Noise Protection Ear Muffs for Babies and Children (NRR 25)5BillyAugust 15, 2013These ear muffs are great for our 7 month old. DIdn't even cry when we first put them on. The Ear Plug Store had them cheap and the shipping was fast!! Pro-Ears ReVO Premium Noise Protection Ear Muffs for Babies and Children (NRR 25)5MICHAEL J GRAPHIXJuly 18, 2013These earmuffs seem to be well-made and the carry bag keeps them clean. My son said they are quire comfortable as he wore them for a two-hour movie with no discomfort. They seem a bit tight, but I'm sure they'll wear in. Overall, I'm very pleased with the quality and performance. Pro-Ears ReVO Premium Noise Protection Ear Muffs for Babies and Children (NRR 25)5JBJuly 5, 2013These work great for my Toddler. Got a pair for the infant, but she doesn't like anything on her head. Cuts noise way down. Pro-Ears ReVO Premium Noise Protection Ear Muffs for Babies and Children (NRR 25)5CourtneyJune 30, 2013I bought these for my 4 1/2 month old. They fit very well, snug but not so tight that she fussed having them on. We attend a lot of concerts and it was important for our daughter to be able to join us, and these headphones are well worth the investment. She was so comfortable that she fell asleep with them on during a concert. Would recommend them to anyone. Pro-Ears ReVO Premium Noise Protection Ear Muffs for Babies and Children (NRR 25)5Sarah M.June 27, 2013When my son first tried these earmuffs on around the house he didn't like them, but when we recently went to a Tigers baseball game he wore them like a champ! He usually is bothered by huge crowd noise, but with these earmuffs the noise didn't even phase him! Pro-Ears ReVO Premium Noise Protection Ear Muffs for Babies and Children (NRR 25)5ShardaiMay 14, 2013I bought these headphones for my 17 month old to wear at the monster truck races. They worked wonders on his ears. He even fell asleep mid car race. Pro-Ears ReVO Premium Noise Protection Ear Muffs for Babies and Children (NRR 25)5Danna JohnsonApril 16, 2013This product is great. Expanding to grow with child. Got these for 15 MO OLD grandson to attend Nascar race. Pro-Ears ReVO Premium Noise Protection Ear Muffs for Babies and Children (NRR 25)5A.R.April 1, 2013Great product in all aspects. Would buy them again. Pro-Ears ReVO Premium Noise Protection Ear Muffs for Babies and Children (NRR 25)5EmilyMarch 27, 2013I love these ear muffs. They are comfortable to wear and easy to put on. My infant daughter loves wearing hers and they come in very handy for those noisy situation. Pro-Ears ReVO Premium Noise Protection Ear Muffs for Babies and Children (NRR 25)5rachaelMarch 7, 2013I bought these for my 21 month old so i could take him to motorcross races. He absolutely loves wearing them & looks for them everytime we go! Would definently recommend these to anyone looking for the best protection for their little ones ears!!! Pro-Ears ReVO Premium Noise Protection Ear Muffs for Babies and Children (NRR 25)5dave kDecember 13, 2012I took my 3 month old son to an indoor concert. He was sleeping in his car seat when we sat down. Before the music started we put the muffs on him. The concert went loud and strong for over an hour. He didnt even wake up!!! GREAT PRODUCT!!! Very happy with my purchase!! Pro-Ears ReVO Premium Noise Protection Ear Muffs for Babies and Children (NRR 25)5bob vondrasekDecember 10, 2012Works great. A little pricey. Pro-Ears ReVO Premium Noise Protection Ear Muffs for Babies and Children (NRR 25)5Monika RoseOctober 20, 2012My son has Sensory Processing Disorder AND a big head so these were a great find. They are very well made, look stylish and most importantly, block out the noise. The package arrived quickly too. Very impressed. Pro-Ears ReVO Premium Noise Protection Ear Muffs for Babies and Children (NRR 25)5DebbieOctober 11, 2012My 17 daughter whom sustained a brain trauma 8 years ago is very sensitive to sound. In the past we have used the Etymotic Musician plugs for concerts. They worked well for her particularly for outdoor concerts, the indoor concert she could only sustain about 90 minutes. We went to a special concert indoors this weekend and used the Ear Muffs, they were ideal for a 3 hour concert. She could still hear all the sounds though they were scaled down. I will definitely use these again. Pro-Ears ReVO Premium Noise Protection Ear Muffs for Babies and Children (NRR 25)5ChristineOctober 1, 2012My son, who has ADHD, is happily wearing these muffs to block out classroom noise while he writes. They are really comfortable and he finds that the noise is completely blocked out so that he can concentrate. Pro-Ears ReVO Premium Noise Protection Ear Muffs for Babies and Children (NRR 25)5SandySeptember 29, 2012Wow! these really work, and are soo comfortable for my grandaughter who has headaches and sensitivity issues. We could no longer go out to restaurants (something she use to love doing) due to noise sensitivity. With these, she goes to restaurants,and other noisy places (shopping centers, crowds) and has a very good time. A bonus is that they come in neat colors/designs and she can be "stylin" when she goes out. This may not be what you guys intended them for, but they are a GREAT filtering system for sensitivity issues. They helped give us our life back! Pro-Ears ReVO Premium Noise Protection Ear Muffs for Babies and Children (NRR 25)5BrianSeptember 25, 2012Wife wasnt crazy with the skulls haha but they worked like a charm. Brought our son to see my band play and he was good to go, and we are LOUD. Pro-Ears ReVO Premium Noise Protection Ear Muffs for Babies and Children (NRR 25)5MichaelaSeptember 17, 2012Very happy with these for my 11mth old and he likes them too! Pro-Ears ReVO Premium Noise Protection Ear Muffs for Babies and Children (NRR 25)5ScottSeptember 11, 2012I am so happy that I got these for my 6-month old little girl, Lily. She had the best time at her first Arkansas Razorback football game two weeks ago! She didn't fuss one time about having them on her head, and the best part was she slept threw halftime and the third quarter, so there was not fussiness to deal with! These ear muffs work like a charm, and I will defnitely be getting plenty of use out of them in the future! Pro-Ears ReVO Premium Noise Protection Ear Muffs for Babies and Children (NRR 25)5Sarah WebbSeptember 3, 2012I bought a pair of pink Pro-Ears to take my 8 week old baby to a concert and I was SO thankful I did. I could not believe how loud it was! She was completely unfazed by the noise. She drank her bottle wearing them, chilled on the blanket looking super cute, then fell asleep with them on. Total success! Less than a week later they were back in the diaper bag as we headed off to our rivalry football game in a noisy stadium. These things have already paid for themselves. The PERFECT solution! 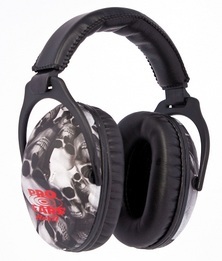 Pro-Ears ReVO Premium Noise Protection Ear Muffs for Babies and Children (NRR 25)5AprilJuly 9, 2012I purchased two pairs of these for our 3 year old son and 17 month old daughter when we recieved free tickets to Monster Jam. They arrived the next day as promised. The kids loved them, they fit perfectly, and were very comfortable for them! At one point my daughter knocked hers off and immediately put her head down and tried to hide, which said to us that it made a dramatic difference in the noise level. She did not attempt to take them off after that. My son refused to take them off even after the show and wore them the whole way home. So happy I spent the extra money to get good quality ear muffs so we have them to use at future events. Pro-Ears ReVO Premium Noise Protection Ear Muffs for Babies and Children (NRR 25)5KerrieJune 26, 2012I bought these for my son to wear to a motocross event and he was able to enjoy the races without being upset by the noise. Great product! Pro-Ears ReVO Premium Noise Protection Ear Muffs for Babies and Children (NRR 25)5Gordon WeltJune 22, 2012Just got a set for my 19 month old, and his 7 month old brother. The fit is awesome, and we just got done watching the Air Force Thunderbirds, and not a flinch, tear, or complaint!! And the best part-they kept them on for the entire show!! Worth every penny!! Pro-Ears ReVO Premium Noise Protection Ear Muffs for Babies and Children (NRR 25)5brianJune 19, 2012we bought these for our 6 week old daughter so we could take her to the local motocross race because her older sister races. We didn't want to expose her to the loud bikes and quads so we put these on and she was able to stay there and even sleep while the loudest ones were racing. It was a great investment! Pro-Ears ReVO Premium Noise Protection Ear Muffs for Babies and Children (NRR 25)5MitchJune 8, 2012We got these for our 5 month old so we could go watch the Thunderbird perform at an airshow. They fit him perfectly and he even fell asleep while wearing them (with 5 F-16's flying around). These ear muffs really did the trick. Great quality product and worth every penny. Pro-Ears ReVO Premium Noise Protection Ear Muffs for Babies and Children (NRR 25)5Josh & Tiffany ManorJune 7, 2012Purchased these Muffs for my 6 Month Old to attend NHRA Drag Race! They fit him perfectly. He kept them on and seemed comfortable even feel asleep at a couple different points - For those that do not know Drag Racing is one of the loudest events EVER! Very happy with the Purchase/Product!!! Pro-Ears ReVO Premium Noise Protection Ear Muffs for Babies and Children (NRR 25)5Aubrie P.May 30, 2012Love this product! Pro-Ears ReVO Premium Noise Protection Ear Muffs for Babies and Children (NRR 25)5Nicole CancholaMay 23, 2012Fit him perfect for when I am vacuuming, or for any concerts we might make it to with a baby =D (hope to make it to). we tried to put some small adult ones on him and they did not fit as well nor where they as lightweight and comfy as these are on him. LOVE them worth the buy. Pro-Ears ReVO Premium Noise Protection Ear Muffs for Babies and Children (NRR 25)5Mark SmithMarch 27, 2012I bought these muffs for my son. He's 4 years old and learning to shoot his Crickett .22. I want him to learn to shoot and to do it safely. While nothing takes the place of supervision and safe gun handling, his safety and well being are paramount to me. These muffs fit him much better than the adult one's that he was using. Plus they are orange, his favorite color, so that is a huge bonus as far as he is concerned. Pro-Ears ReVO Premium Noise Protection Ear Muffs for Babies and Children (NRR 25)5DianeMarch 14, 2012I picked these up for my 8 month old grandson and they fit him very well and He does not try to take them off . I will see if they work when we take him to the VooDoo football games ,will let you know! Pro-Ears ReVO Premium Noise Protection Ear Muffs for Babies and Children (NRR 25)5MelissaMarch 6, 2012My son loves these. He runs to get them now when anything is loud. They must be comfortable as he wears them for long periods of time without complaint. We use them for ballgames, fireworks, and construction sites. As a parent, I love that these provide the best protection there is. They also adjust well and he will be able to wear them for a long time. Thanks for such a great product. Pro-Ears ReVO Premium Noise Protection Ear Muffs for Babies and Children (NRR 25)5andyFebruary 5, 2012These really are for kids. They're top quality including the adjustable headbands and thick ear pads. The boys wear these without much trouble. These are ACTUAL noise protection. You cannot buy a child sized muff in a higher NRR. I tried. The cheap widely available muffs are NRR 19. That is NOT for a sustained noise environment like the drag strip or shooting range. Spend the extra 20 bucks and get your children some real hearing protection. Pro-Ears ReVO Premium Noise Protection Ear Muffs for Babies and Children (NRR 25)5Sally ADecember 1, 2011I love these. They have the highest noise reduction rating I've found for children's ear muffs and they come in really cool colors!